My anxiety generally manifests itself in a particular way. I become unable, at times, to believe that anyone outside of my family truly loves me or wants me around. This, of course, is unfair to myself and equally unjust to those friends that do care for me. Feeling like I've wronged those I love, I begin to spiral further. I've always found my way out of that mindset, usually with the help of others, but I continue to return to that fear: what if, somehow, someday, I finally push everyone away for good? Three of the year's best films -- Inside Llewyn Davis, Frances Ha and The World's End -- are nightmare scenarios for me. Each one centers on a protagonist who has, or is in the process of burning every bridge in sight. All three focus on how to screw one's life up, and their paths are roughly the same: fail to allow those who love you to do just that. 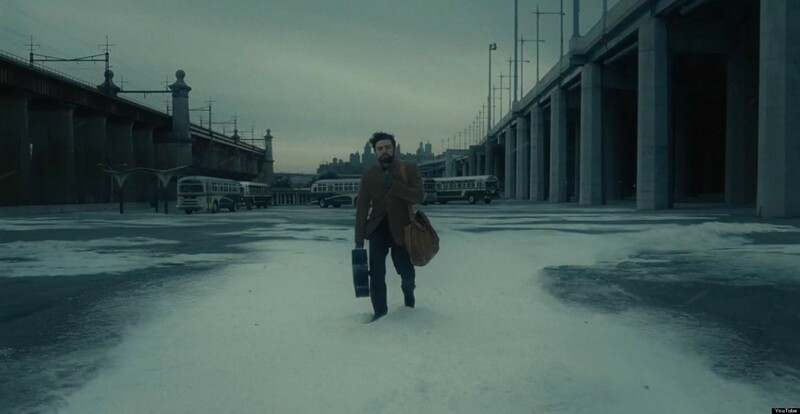 The eponymous main character of Inside Llewyn Davis (Oscar Isaac) is a destructive vortex since the death of his friend/musical partner, though there are plenty of hints that Davis' troubles predate the loss. He verbally berates his agent, overstays his welcome with an ex and her new love, and crudely yells at an elderly female musician. At a dinner party he becomes volatile towards one of the few people that kindly offer him shelter and warm food. The horror of the dinner party is also on full display in Frances Ha. In that particular scene, Frances (Greta Gerwig) is unable to recognize that none of the adult strangers around her give a damn about old college gossip. She's completely out-of-touch, oblivious to the conversational standards of her age group. Llewyn has the ability to read a room, but often fails to care about what others want to hear. He lashes out at those around him both because he cannot control himself, and because he doesn’t particularly want to. This seems to be the key difference between Llewyn and Frances: Frances isn’t aiming to hurt or offend those close to her, whereas Llewyn seems to want to inflict his internal pain onto others. The World’s End’s Gary King (Simon Pegg) falls somewhere between the two on the scale of maliciousness. He’s fully aware that the acts he commits (lying about his mother’s death, leaving his friend alone in a crashed car, etc.) are horrid. The difference between Gary and Llewyn is that the former is able to delude himself into believing (or pretending to believe) that all of his sins are funny, in whatever warped way. He laughs off tragedies because he must, rather than let the full weight of his disappointment land on his shoulders (as it does towards the film’s close). Regardless of their separate intentions, the result for all three characters is the same. Friendships are broken over time, as the wedges the protagonists drive become too much for the supporting characters to bear. Another link between the three in this regard is the focus on friendships over romantic love. Frances begins her most troubled period of life after Sophie (Mickey Sumner) moves out. Gary spends his film attempting to reassemble the old gang that used to have crazy adventures but now sell real estate. And, as mentioned above, Llewyn’s cold behavior is further spurred on when the man he used to harmonize with jumps off the George Washington Bridge. That idea of harmony, of two voices supporting each other and creating a greater whole, is the best symbol in any of the three films for the idea of connection. Those that can sing with others in Inside Llewyn Davis seem to be doing quite fine. But Llewyn loses it when someone sings his old partner’s part. That voice has been lost and Llewyn is unable to remake that bond with anyone else. Romantic love is a piece of these larger wholes, especially in the case of Davis. But even in that film, the final scene between Llewyn and Jean (Carey Mulligan) reads more as a human bond reforming, rather than a romantic or sexual one. The speech that a drunken Frances gives her uninterested host after the dinner scene regards how she imagines a romance to be. Yet when that speech is played out late in the film it’s between herself and Sophie rather than herself and some guy. It’s not that romance is unimportant, but rather that friendships, and familial bonds better display the basic desire for human connection. It’s not about finding a spouse or getting laid, it’s about having someone to talk to in regards to how you aren’t finding a spouse or getting laid. The idea that one day you may have no one to call when something goes wrong is a horrifying thought. Frances Ha offers the cleanest redemption in this sense. Frances regains her best friend and refines her identity, represented in one of the year’s most powerful closing shots. Even though Gary King only reconnects to his old pals briefly, The World’s End still closes with him finding a new, less deeply wounded way to deal with life. In this sense, and in many others, Inside Llewyn Davis is the harshest film of the three. In the reveal that the beginning of the film is actually the end, the cycle Llewyn has constructed for himself continues to spin. Yet I see a glimmer of hope in the key piece of the scene that we only glimpse the second time around. Llewyn makes it through a performance of “Fare Thee Well”, the song that he used to sing with his partner. It isn’t much, as he remains homeless and lonely, and hears a young man named Bob Dylan out to steal whatever spotlight may be left in the folk scene. But it is something, purposefully omitted from the scene’s placement at the beginning of the film. After all that Llewyn goes through, he begins to rebuild this bond. That bond is with a dead man, a spirit no longer tangible. That’s better than nothing, though. We all need someone to help us through our worst days, even if that someone is just a memory. That seems like an obvious idea, but these three films prove how complicated the lesson can be to follow. The most universal truths are like folk songs. They’re never new, and they never get old.